Put 12credit from the bank on Adonis Campaign when rezzed. When there are no credits left on Adonis Campaign, trash it. Take 3credit from Adonis Campaign when your turn begins. "Hellloo ladies. Look at your plans, now back to me, now back at your plans, now back to meee. Sadly, only HB has me. But if you stop spending all your influence on over-expensive ICE and rent some hot Bioroids you can have a splash with me. Look down, back up, how are you? You're flat broke, tied at six points, with no man to advance your plans with. One more time, now with me. I've got it. Here's 3 credits to do that thing you love. Click again, the credits are now advancement tokens! Anything is possible when your plan can make three money a turn and not have to click for credits. Just protect me, of course." Adonis Campaign is one of the more common drip economies that require influence. It certainly has seen its play, holding quite a bit of money on it. It also tends to be rather safe. If the runner trashes it before it is rezed, they are out 3 and the corp is just out a click of the install. If they trash after its rezzed and fired once, its only a credit lost. Trash it after it has fired more than once and it is almost not worth it for the runner. 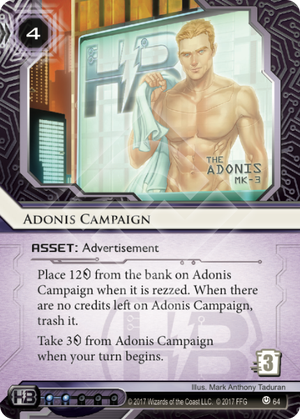 It must be said that the only time to rez an Adonis Campaign is during the paid ability window at the end of the runner's turn. This way the runner doesn't have a chance to trash it, and the corp gets the first income drip right away. Rezing it any time before that just gives the runner a chance to trash it without the corp collecting any money. The existence of Eve Campaign means it can often be overshadowed. Eve has longer staying power and a higher trash cost, even if it does provide less per turn than Adonis. Combined however, they make a potent drip economy, especially with the likes of PAD Campaign. Adonis lower rez cost is often what gets it in the door over Eve, combined with the greater per turn gain. That does not mean Adonis is useless however. It is good, reliable money, and even if the runner is just trashing it as soon as they can, then it is causing them to spend money on actions that are not stealing agendas or preparing to steal agendas. It continues to see use, and will continue to be a solid useful bit of drip economy. I would like to mention, for the new players that if you use this with Blue Sun: Powering the Future you can choose which order things happen in. Ergo, you rez this at the end of the runners turn, or the start of yours, collect 3, and then Blue Sun to pick it back up. This effectively nets you 3 for 1.